Wilson Combat's new X-TAC makes custom-level performance a bit more affordable. Most owners of 1911s know that they are holding in their hands a design fully a century old, and many know John Browning designed it. Those same people, however, are largely ignorant of the fact that the 1911 has existed in basically one form, and one form only, for the majority of its existence. In 1980, if you wanted a 1911 that was reliable with hollowpoint ammunition, accurate and comfortable to shoot, the only option was to buy a basic Government model and give it to a gunsmith. There he would (at minimum) polish and adjust the feed ramp and barrel so as to be reliable with all types of bullet profiles; tighten the slide to barrel to frame fit; perform a trigger job; bevel the mag well; and install good aftermarket sights, a beavertail grip safety and an oversize thumb safety. No manufacturer offered more than one or two of the above options on any of their guns, and if you wanted a beavertail grip safety or oversize thumb safety, they pretty much had to be handmade by a gunsmith. Enter the commercial genius of Bill Wilson. Henry Ford didn't invent the automobile, and Bill Wilson didn't have a hand in the creation of the 1911, but both men took an object and did something with it that no one else had done before in quite the same way. In Bill Wilson's case it was creating and producing custom parts for 1911s that either required very little gunsmithing for installation or, in some cases, no gunsmith intervention at all. Bill Wilson was known as a nationally-ranked IPSC shooter, and competed on three world shoot teams, using 1911s he himself customized. Early in life he was involved in watch repair, so when he started tinkering with 1911s he likes to laugh that the parts seemed huge. Working on his own guns evolved into a successful gunsmithing enterprise, then the 1911 parts business took off. Today, Wilson Combat employs more than 50 people, and while it still makes just about every replacement part you could want on a 1911 (including frames and slides), it still produces some of the finest custom 1911s in the world. The X-TAC features deep X crosscuts on the rear of the slide for a firm grip, and the rear Battlesight has a wide, deep U-shaped notch. Bill Wilson no longer does all of the work on the guns coming into the shop, but every pistol produced by Wilson Combat is still made by hand by skilled gunsmiths. Its latest model, the X-TAC, is no different. To say that the X-TAC is an entry level pistol from Wilson Combat is a bit like saying a Cadillac CTS is a compact sedan; it doesn't quite tell the whole story. This new model is currently offered only in a five-inch barreled .45 ACP, but for lovers of the 1911, that's the only barrel length and caliber they need. At first glance, what sets the X-TAC apart is the unusual texturing on the pistol's front- and backstrap. The deep-cut crisscrossed Xs are unique and surprisingly functional. I would say they provide a gripping surface as aggressive as medium checkering. Wilson refers to the Xs as the tread pattern. The slide serrations have also been replaced with the overlapping Xs, where I found it less aggressive to the touch than standard serrations--the only downside to the style choice. The X-TAC comes with Wilson's new G10 Starburst grips. When I first saw the Starburst-pattern grips last year, I thought the design bordered on plain. It was only when I picked a pistol up that I realized that the design had much more to do with function than form. Recoil forces pivot a pistol in the hand, trying to get it to pull up and out. The grooves in the Starburst grips seem to lock around the fingers, providing a much better gripping surface to fight the forces of recoil. G10 laminate grips provide an even better gripping surface than the wood Starburst-pattern grips Wilson puts on some of its models, although I think the wood ones are prettier. The X-TAC tread pattern on the slide carries over to the front- and backstrap, and combined with the G10 Starburst grips it offers superior control. Wilson also undercuts the trigger guard so you can get a higher grip on the gun. This makes much more of a difference in recoil control than you might think. The X-TAC's is fully undercut, and if you hold up the X-TAC next to an original GI frame, you'll how different the two are, just how much metal has been removed. The X-TAC comes with a match-grade barrel and bushing and Wilson's Bullet Proof parts--including tactical thumb safety, hammer, sear, beavertail and slide release. I didn't understand the advantage of the Bullet Proof parts until I saw them being made at the Wilson shop. They're milled out of solid pieces of steel on CNC machines--no casting or MIM parts here. The X-TAC has a match stainless bushing and barrel, and the green fiber-optic sight is well-protected by steel. New with the X-TAC is a ramp front sight with a green fiber-optic insert, matched with the company's rear U-notch Battlesight. The notch in the rear no-snag sight is larger than what most people might be used to and provides a lot of daylight around the front sight. Fiber-optic front sights are also very "in." I know a lot of people who have been using them in competition for quite some time, but I resisted because more than once I've seen an insert go flying out of a front sight under recoil. Those were some of the first fiber-optic sights, however, and in new designs, such as the one on the X-TAC, the fiber-optic insert is much more protected inside the steel front sight. This is the same front sight Bill Wilson currently has on his own carry pistol. Whether you have good eyes or bad, the glowing dot of a fiber-optic front sight really helps get back on target quickly. I found that I was losing a plain black sight under recoil, but once I switched to a fiber optic I could track it throughout the entire recoil impulse. If you decide a fiber-optic front sight just isn't for you, a tritium-insert front sight is available as an option for an additional $25. The finish is black Parkerizing, and all the sharp edges on the X-TAC have been dehorned, which only makes sense on a pistol designed for carry. 1911s with standard factory corners have drawn blood from me more times than I can count. Bill Wilson loves strong springs, and the recoil spring on the X-TAC felt like an 18-pounder (original GI specs call for 161/2). Stronger recoil springs soften the recoil impulse but result in more muzzle bounce. The mainspring was full power as well, but that didn't affect the trigger pull, which came in at a crisp, consistent 33/4 pounds. The X-TAC is advertised as having a trigger pull between 31/2 and 33/4 pounds, which will probably cause heart palpitations in those who scream that anything less than a four-pound pull is unsafe and will get you sued. Perhaps not coincidentally, the X-TAC shot best with Wilson Combat's own ammo, in this case the load specifically designed for five-inch barrels. Every bullet that leaves your gun in a gunfight has a lawyer attached to it anyway, so to my way of thinking it's better to carry a gun that has a trigger pull that actually allows you to hit what you're aiming at. 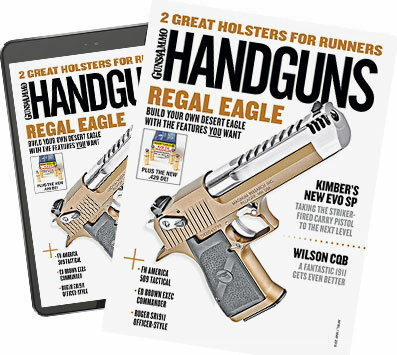 The X-TAC features a beveled magazine well and comes with two of Wilson's famous 47D magazines. Also, like all Wilson pistols, it is supplied with a very nice soft case and a test target from the factory--in this case, a five-shot group measuring 0.65 inch at 15 yards. The X-TAC's frame, barrel and slide were all perfectly fitted, but on a Wilson pistol that's like saying the sky is blue. Wilson Combat is so successful because of its consistent quality, year in and year out, with excellent customer support. Wilson Combat guarantees one-inch groups at 25 yards with its pistols, a promise it couldn't make without superior quality control. I took a tour of Wilson Combat recently and saw some of its pistols, including an X-TAC, being put together by gunsmiths who have years of experience. Those pistolsmiths who work on the Wilson Supergrades, for instance, have at least 10 years experience, and the test target that came with my test X-TAC listed the 'smiths who built that gun. All of the gunsmiths are skilled enough to produce a finished pistol starting with nothing more than a pile of rough parts, but to ensure consistency from one pistol to the next, they specialize. One will be an expert in fitting frame to slide, another will perform trigger jobs, and every man checks the work of the man before him. On a side note, Wilson's new guys have to earn their bones by doing time on the firing line, test firing each and every pistol before it leaves the premises. Do something long enough and you get very good at it, and these human Ransom rests can outshoot just about anybody. How much shooting do they do? Well, each and every Wilson pistol, before it leaves the factory, is put through an 82-round reliability test using full metal jacket, jacketed hollowpoints and semiwadcutter bullets through Wilson eight- and 10-round magazines, and if the pistol jams even once it doesn't ship. During my testing, the aggressive X-TAC tread pattern didn't chew up my fingers like sharp checkering does, and the fiber-optic insert glowed like it was battery powered in direct sunlight, which is exactly what it's supposed to do. The pistol didn't even think about jamming, and when it came time for the accuracy part of the testing, even I was able to get one-inch groups at 25 yards with the gun. I hate shooting groups and am addicted to caffeine, so if I can get those kind of groups with a gun, that's saying something. Few custom gunmakers will guarantee their pistols will do one-inch groups at 25 yards. I know of no other manufacturer that puts its pistols through as rigorous a test as the 82-round reliability test every Wilson pistol must pass before it leaves the factory. Wilson pistols are not cheap, but you get what you pay for.